The protest at Standing Rock Indian Reservation demonstrated one of many instances where corporate and/ or government actions were viewed as violations of Native American Treaties, a threat to Native American well-being, and disrespect for the sacredness of Native land. Our exhibit focuses on the events leading up to the Dakota Access Pipeline construction and the experiences and artistic observations of the many who were there to bear witness. On Museum Hill in Santa Fe · (505) 476-1269 · IndianArtsAndCulture.org Youth 16 and under and MNMF members always free. www.museumfoundation.org/join Enjoy bistro dining with a view at Museum Hill Café. Zoe Urness, Photographer December 5, 2016: No Spiritual Surrender On December 5th, 2016 outside Cannon Ball, North Dakota at Oceti Sakowin Camp on the edge of Standing Rock Sioux Reservation, military veterans march in support of the water protectors. Santa Elena, a carving by Alcario Otero. Photo by Martin Frentzel. Otero. He has illustrated award-winning books for author Rudolfo Anaya; and a massive 10-foot alter he created was purchased by the Museum of Spanish Colonial Art. Mai Ly Torres Baker is a young santera mentored by Nicolas Otero in wood carving, using natural pigments in paint, and preparing homemade varnish. 16: Holiday Schedule Cover Photo: Members of the Sky City Buffalo/Ram Dance Group. Photo by Michael Jiron. 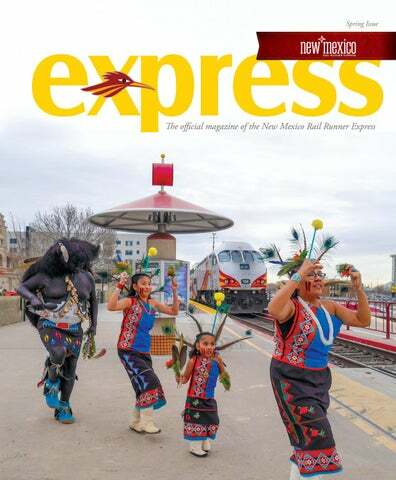 The New Mexico Rail Runner Express Magazine is published three times a year by Moon Dog Publishing and the Rio Metro Regional Transit District. The Publisher and Rio Metro Regional Transit District do not take responsibility for the accuracy or legitimacy of the advertiser’s message or that of the guest writer/columnists (including photos) or any aspect of the business operation or conduct of the advertisers in the magazine. Moon Dog Publishing reserves the right to edit all articles for accuracy and style. For more information and advertising rates, call (505) 350-8695 or (505) 259-7969. Ayer, Hoy, Y Mañana Yesterday, Today, and Tomorrow! Earth Day Events Encourage Sustainability, Environmental Conservation In 1970, no one knew that Earth Day would eventually become the largest celebration of our planet, but it did. From 20 million participants across the United States that first year, Earth Day is now celebrated in 192 countries with more than 1 billion participants advocating a more sustainable world. Founded by U.S. Sen. Gaylord Nelson, this sustainability movement contributed to the passage of many laws protecting the environment. If you missed that fateful April 22 event in 1970, you have several opportunities to join the celebration in 2019. It is possible to use the New Mexico Rail Runner Express to access some of these events scheduled both the Saturday before and after April 22. APRIL 20 EVENTS Hazardous Waste – Can you imagine 86,283 pounds of hazardous waste sitting around homes in Albuquerque? Believe it! That is the amount collected during Albuquerque’s Solid Waste Management Department’s two waste collection events held in 2018. The division is holding its first Hazardous Waste Collection event this year between 10 a.m. and 3 p.m. on April 20. Toxins like automotive paint, oil and antifreeze, gasoline, cleaning supplies, and pesticides and herbicides are being accepted at Advanced Chemical Transport, 6137 Edith NE. “It’s very important to dispose of household hazardous waste correctly,” says Diane Wikler, the Solid Waste Department’s marketing manager and public information officer. “This helps prevent these materials from going into the landfill and watersheds.” Wikler says the agency Painted Lady Butterflies. Gardeners and farmers all can benefit from pollinator has conducted this event gardens. Photo by Martin Frentzel. for four years. The top three hazardous wastes are paint, oil and antifreeze, and empty oil cans with residue. Visit www.cabq.gov/solidwaste/ household-hazardous-waste to learn more. Seed Festival – The Albuquerque Botanic Garden will conduct its annual Earth Day Children’s Seed Festival on April 20 from 10 a.m. to 2 p.m. It is a family event for kids of all ages. “We will talk about the parts of plants and the benefits of having plants around,” says Cheri Vogel, education curator at the Botanic Garden. Vogel says about 300 children attend the event annually, and the kids leave with seed balls, starter plants and booklets containing child-appropriate plant information. The event is co-sponsored by the Rotary Club of Albuquerque, and the Albuquerque BioPark, the umbrella organization for the Rio Grande Zoo, the Aquarium and the Botanic Garden. Those interested in taking transit to the Seed Festival can exit the Rail Runner at the Downtown Albuquerque Station and borrow a Pace ABQ Bike Share bike for a quick ride down to the BioPark, or hop on ABQ RIDE bus route 66 or 766 heading west and exit at Central and New York. APRIL 27 EVENTS Protect Our Species – Animal ambassadors, everything from wolves, raptors, goats and pollinating insects, will be showcased during the 2019 Earth Day celebration from noon to 4 p.m. at Santa Fe’s award-winning Railyard Park on April 27. The Park is a short walk from the Santa Fe Depot Rail Runner Station. Rebecca D’Agostine, marketing director of the Railyard Park Conservancy, says this event follows the national theme of Protect Our Species. “It’s the perfect catalyst for us to focus on local ecology of plants, animals, birds and insects in Santa Fe and New Mexico,” she says. Partnering with the Quivara Coalition, a range-management nonprofit, the conservancy is offering a live grazing demonstration with goats and sheep. “The coalition’s experts will be on hand to explain the importance of restoring our Eastern Tiger Swallowtail. Photo by Martin Frentzel. grasslands,” D’Agostine says. Visitors to this year’s celebration may learn how to grow pollinator gardens that help species like the Eastern Tiger Swallowtail and Painted Lady Butterflies shown here. Many other local organizations will create an educational, fun and kid-friendly event with workshops, live music, a costumemaking station, and interactive games. Learn more at www.railyardpark.org. Great American Recycling Event – The Village of Los Lunas started its recycling program in 1995, and is encouraging everyone to recycle between the hours of 8 a.m. and noon on April 27 at 315 Don Pasqual. Joshua Chavez, assistant supervisor for the village’s Solid Waste Division, says Los Lunas makes between $30,000 and $50,000 every year through recycling cardboard and metals. “The amount depends on the market,” Chavez says. Making money for the village is one of Los Lunas’ recycling goals. The others are protecting the environment and reducing landfill costs. Chavez says Los Lunas also is sending two staff members to the Whitfield Wildlife Conservation Area, 2424 NM 47, on April 27 to participate in that area’s Earth Day celebration. Visit www.valenciaswcd.org/whitfield-wildlife-conservation-area/ for information on the event. SUSTAINABLE LAS CRUCES Earth Day in Las Cruces has been a cooperative endeavor since 1990. The Organization of Aggie Students Inspiring Sustainability (OASIS), courtesy of Railyard Park managed the event for years, Photo Conservancy. and now the city, Dona Ana County, New Mexico State University and the Green Chamber of Commerce are continuing the tradition on April 20 from 8 a.m. to noon at the Las Cruces Plaza. “Our goal is to encourage local and sustainable practices,” says Lisa Larocque of the Las Cruces Sustainability Program. “The festival includes educational booths, cultural and musical presentations, a March for Science, a Recycle Fashion Show, local vegetarian food vendors and a zero-waste recycling center,” she says. “’Reduce, Reuse, and Recycle’ is nature’s message for our Earth Day Festivals!” Larocque says. Experience the World’s Largest Pow Wow Typically, New Mexico is at its most colorful during the fall. Bright balloons float through the crisp sky, the aspen and cottonwood leaves spin to gold, and in remote canyons, maple trees splash the mountains with red. Springtime in Albuquerque, however, has its own celebration of color. Native American dancers congregate in blazes of every color under the sun, and Native drum groups and musicians rock Expo New Mexico during the annual Gathering of Nations. The 36th Annual Gathering of Nations, taking place this April 25-27, is a blend of cultural awareness, Pow Wow dance competition, trader market and social gathering. In addition, Miss Indian World is crowned during the two-and-a-half-day event. “The cultural aspect is the most important part.” says Melonie Mathews, “It is the reason the Gathering exists.” In addition to being a spokeswoman for Gathering of Nations, Mathews is the organizer of the Miss Indian World competition. and share their culture and tribal traditions.” “Many of the contestants have never been presented to such a large audience, so part of their growth is reaching out to their communities for assistance and support,” said Mathews. Women ages 18 to 24 are judged on several qualities, including traditional talents, public speaking and their dancing. The competition begins at 7 p.m. on April 25 in the Kiva Auditorium at the Albuquerque Convention Center with the Traditional Talent Competition. The young women compete in public speaking at 2 p.m., April 26, Stage 49 at Expo New Mexico, and the contestants will also l be judged that day at 8 p.m. for their dancing. The Miss Indian World Crowning is at 8 p.m. April 27. Thousands of Native American dancers like Brando Jack compete in the annual Gathering of Nations being held April 26-27 at Expo New Mexico. A PACKED HOUSE As one can imagine, the world’s largest Pow Wow attracts a lot of interest. Mathews says about 80,000 people attend the Gathering of Nations, and many of the dancers participate in the Grand Entries at Tingley Coliseum. Dancers of all ages – tots to Golden Age and Elders – wearing Native dress assemble on the floor of the Coliseum. Grand Entries are scheduled for noon and 7 p.m. on April 26, and noon and 6 p.m. on April 27. Thousands of dancers and drummers come from 500 tribes across North America, and about 800 artists and crafters will be displaying their wares at the Indian Traders Market April 26 and 27. Another fascinating event is the Traditional Horse and Rider Regalia and Parade contest on Main Street at Expo New Mexico. The riders are judged for their traditional attire and accessories, groomed and traditional tack, and appearance and showmanship. As Mathews says, culture and tradition play a huge role throughout the Gathering, but there is also a chance to hear contemporary Native American music at Stage 49. “You will hear all kinds of music at Stage 49,” Mathews says, “Rock, blues, reggae, hip hop, country, DJ’s, and Jam bands.” Stage 49 was originally established to provide attendees a place to listen and relax after the competitions were completed. The venue stays open until 10 p.m. on the 26th and 27th. Admission is $19 a day and that includes admission to the competitions in Tingley Coliseum, the Indian Traders Market and Stage 49. Reserved seating is $70. The fee for the Miss Indian World competition at the Convention Center is $15. To learn more about the 36th Annual Gathering of Nations, information on specific events, and to purchase tickets, visit www.gatheringofnations.com. WE. ARE. LOBOS. U N M -VA L E N C I A I S M O R E T H A N J U S T A B R A N C H C A M P U S . We are educating the minds that will save lives. We’re teaching students to visualize their dreams and make them reality. We’re teaching students the skills they need to succeed. Students are afforded the opportunity at a lower cost, higher education. From art to pre-engineering and welding to business administration, we have a degree or certificate plan to help you create a more prosperous future. Here, you can be who you want to be — you can be a Lobo! CHAMA: New Mexico’s Mecca for Year-Round Fun One of the best-kept secrets in New Mexico is the enchanting Village of Chama. With an elevation of 7,860 feet, Chama is nestled high in the Southern Rockies, just 120 miles North of Santa Fe. The historic Cumbres & Toltec Scenic Railroad steam trains leave the Chama depot daily from Memorial Day weekend to mid-October. Riding the railroad is a day trip of exhilarating mountain views, deep gorges, beautiful spring wild flowers and later in the season, amazing fall colors. Fishing local trout streams and lakes is a leisurely pleasure. For a more challenging experience try fly fishing the Rio Chama, which runs the east side of the Village.Hikers and mountain bikers find many trails including the Continental Divide Trail nearby. The Sargent’s Wildlife Area surrounds Chama with meadows and trails for hiking and horseback riding. Hunting adventures with reliable guides are close to town. Chama has a lively western-style business district with lodging, RV Parks and cozy dining establishments. Located at the junction of highway 17 and U.S. 84 (take State Hwy 285 north from Santa Fe to Española then take the “Chama Highway” (84) north), the Village of Chama is the perfect destination for anyone seeking scenic outdoor recreation. Crowds gather in Chama for the famous Fourth of July fireworks display. The Cumbres & Toltec Scenic Railroad offers a fireworks train in the evening. Chama Days, the second weekend of August, is always fun with a softball tournament, NMPRC Rodeo, dances, and a parade. Enjoy the Valley Studio Tour every Labor Day weekend and visit local artists. Cool times in cool pines are the epitome of summer fun in Chama’s cabins and vacation ranches. Oh, yeah, and it’s an absolute mecca for winter sports, too! For your safety and comfort bring a light jacket or sweater for those cool evening walks and check with the local ranger district before heading out to hike. Never travel alone and make sure you are adequately prepared. At these altitudes, the weather can sneak up on you. Springtime on the Chama River. Photo courtesy of www.exposureandfstop.com. Shown are departure times, unless otherwise noted. Horario demuestra tiempos de salida a no ser que se indique lo contrario. 505-245-RAIL(7245) www.riometro.org Customer Service Hrs. Mon.-Fri. 5am-9pm Sat. & Sun. 8am-4pm Horas de Servicio al Cliente: lunes a viernes 5am - 9pm sábado y domingo 8am - 4pm. Mobile APP (NMRX) For Apple and Android. riometro.org Purchase and print tickets. On The Train: Fares are collected by a ticket agent. Question & Answer How do I buy tickets? Tickets can be purchased online at riometro.org, onboard the train from the ticket agents, or on the Rio Ticketing app. We accept cash, debit, and credit cards (except American Express). Are discounted tickets available? Reduced fares are available to youth ages 10-17, students with a valid ID, seniors age 62+, and people with disabilities. Children 9 and under and veterans with a VA medical card ride free. See the fare information listed in this magazine for details and a list of acceptable ID cards. Do you offer a discount for group travel? Discounted rates are available for groups of 25 or more. Contact Rio Metro’s Customer Service office at 866-795-7245 prior to travel date for details and pricing. Is my ticket refundable if I don’t use it? Tickets are non-refundable and non-transferable. Can I buy a ticket for someone else? Yes, you may purchase a ticket for another person from our online ticketing (riometro.org). You will need to email the ticket to the person you are buying it for; they can either print it out or show it to the ticket agent on their mobile device. Can I charge my mobile device on the train? Electrical outlets are available for passenger use at each of the tables on the train. Tables are located on the mezzanine and upper levels only. Can I bring my bicycle/sports equipment on the train? Bicycles, skis and other sporting equipment are welcome on the train at no charge. Each train car has designated space for up to 8 bicycles. During the winter months, the train also provides storage containers for ski equipment. Please store your equipment in the designated storage areas. Are pets allowed on the train? Pets are not allowed onboard, only service animals. Service animals can be guide dogs for the blind or visually impaired, signal dogs for the hearing impaired, or other types of animals that can be individually trained to work or perform tasks for an individual with a disability. Learn more about riding with a service animal at riometro.org. Can I use my train ticket to get on area buses? Yes. Your train ticket or VA medical card allows free bus connections on ABQ RIDE, Rio Metro, Santa Fe Trails, and most NCRTD buses on the same day of travel. Additional bus connections are available for a nominal fee. How old do children need to be to ride alone? Children must be at least 10 years old to ride the train without a supervising adult. What happens if I leave something on the train? If you leave an item on the train, please contact Customer How does Seniors 62+ Ride Free work? Service at 505-245-7245. Lost items can be picked up at Every Wednesday in 2019, seniors age 62+ can ride any Herzog Transit Services, 100 Iron SE, Albuquerque, 87102, north or southbound train for free. Just show the ticket Monday-Friday 10 a.m. – 2 p.m. Non-essential items are held for agent your valid photo ID (must contain birth date). To 30 days. Essential items, such as keys, IDs, wallets, phones, make a bus connection, ask your ticket agent to print out a purses, etc. will be held for 90 days. If you find an item on the free transfer slip. train, please turn it in to a ticket agent or conductor. Is there parking available at the train stations? Free onsite parking is available at all of the Rail Runner stations with the exception of Downtown ABQ and the Santa Fe Depot. Parking at Downtown ABQ and the Santa Fe Depot is available for a fee at adjacent parking facilities. Overnight parking is at your own risk. Are there restrooms on the train? At least one restroom is available on every New Mexico Rail Runner Express train. Longer trains will have more than one restroom. Can I bring or buy food on the train? Passengers are welcome to bring and consume food and beverages (excluding alcohol) on the train. Food and beverages are not available for purchase on the train. South Capitol Shuttle - Weekdays to St. Vincent Hospital, the Rodeo Business Park and the District 5 DOT office. NM Park & Ride Blue Route Weekdays to Santa Fe, Pojoaque and Los Alamos. NM Park & Ride Red Route Weekdays to Espanola, Pojoaque and Santa Fe. Santa Fe Trails Route 4 (Southside) - To the Santa Fe Convention Center, City and County offices, Santa Fe High School and Santa Fe Place Mall. Santa Fe Trails Route 2 (Cerrillos Road) To the West Capitol Complex, the New Mexico School for the Deaf and Santa Fe Place Mall. (connect here to SF Outlet Mall (Route 26). NCRTD Taos Express - To Española and the Town of Taos. Saturdays and Sundays only. Santa Fe Trails Route M (Museum Hill) Access to the Museum of Spanish Art, Museum of Indian Arts & Culture, Museum of International Folk Art and the Wheelwright Museum of the American Indian. Santa Fe Trails Route 4 (Southside) To the Santa Fe Convention Center, City and County offices, Santa Fe Place Mall and Santa Fe High School. Santa Fe Pick Up - To the Santa Fe Plaza, Downtown Santa Fe, Canyon Road and Museum Hill. Operates daily. Turn left when exiting the train to the shuttle and look for the red truck sign. Buffalo Thunder Resort & Casino Shuttle Shuttle stops on Guadalupe right next to Tomasita’s Restaurant. Shuttle meets train daily. Tesuque Casino Shuttle Shuttle stops on Guadalupe across from the Cowgirl Cafe. Shuttle meets train daily. Santa Fe Trails Route 2 (Cerrillos Road) To the West Capitol Complex, the New Mexico School for the Deaf and Santa Fe Place Mall. (connect here to SF Outlet Mall (Route 26). Sandia Resort & Casino Shuttle Meets every train, seven days a week. Rio Metro Route 204 - Weekdays to Bernalillo, northern Rio Rancho, Zia Pueblo, San Ysidro, Jemez Pueblo and Jemez Springs. Route 505 - Weekday express service to Downtown Albuquerque before the first southbound train of the morning. Santa Ana Star Casino Shuttle Meets every train, seven days a week. Rio Metro Route 201 - Weekdays to Bernalillo and Enchanted Hills. Rio Metro Route 202 - Weekedays to Bernalillo, Rio Rancho, Santa Ana Pueblo, Algodones, Santo Domingo Pueblo, Cochiti Pueblo and the Town of Cohiti Lake. Rio Metro Route 202 - Weekdays to Bernalillo, Rio Rancho, Santa Ana Pueblo, Algodones, Santo Domingo Pueblo, Cochiti Pueblo and the town of Cochiti Lake. Ride Purple Bus Route to the South Capitol & Santa Fe Depot Stations. Weekday departure at 5:11 a.m.
Rio Metro Route 206 - Weekday service for Belen residents to connect to the Rail Runner station and other nearby work centers during peak commute times. Rio Metro Dial-A-Ride - Weekday curb-to-curb service in Valencia County. Rides must be requested by 12 NOON one business day prior. Call 505-352-3595. $1 each way. Socorro Shuttle - Service to Socorro Weekdays and Sundays. Rio Metro Route 207 - Weekday service for Los Lunas residents to connect to the Rail Runner station and other nearby work centers during peak commute times. Connects to Route 209. Rio Metro Route 209 - Weekdays between Los Lunas Transportation Center and the UNM Valencia Campus. Connects to Route 207. Rio Metro Dial-A-Ride - Weekday curb-to-curb service in Valencia County. Rides must be requested by 12 NOON one business day prior. Call 505-352-3595. $1 each way. NM 599 Station Shuttle - Weekdays to Bisbee Court, the New Mexican Plaza, VA Clinic, Presbyterian Hospital, and Santa Fe Place Mall. NCRTD Route 270 - Weekdays to the NM Department of Corrections, Oñate Complex (National Guard) and the Santa Fe County Detention Center. Santa Fe Trails Route 22 - Weekdays to Santa Fe Community College, Rancho Viejo and IAIA. NM Park & Ride Purple Route - Weekday direct connection between the Rail Runner and Los Alamos. Please contact the connection provider for fares. Isleta Hotel & Casino Shuttle - A bus meets every train, seven days a week. ABQ RIDE Route 222 - Weekdays to the South Valley, VA Hospital, Kirtland Air Force Base and the airport business district. Can also be used to access the Albuquerque International Sunport for passengers coming from and going to Valencia County. ABQ RIDE Rapid Transit 766 Red Line - Express route to access Old Town, the ABQ BioPark, UNM, Nob Hill and Uptown. ABQ RIDE Rapid Transit 777 Green Line - Express route to access UNM, Nob Hill, and the foothills near Tramway. ABQ RIDE Route 66 - Access to locations along Central Ave. including Central & Unser Park & Ride, City and County buildings, UNM and EXPO NM. ABQ RIDE Route 53 - To Isleta Blvd, the Albuquerque Zoo and the National Hispanic Cultural Center. ABQ RIDE Route 217 - To Central New Mexico Community College (CNM) and Kirtland Air Force Base. ABQ RIDE Route 250 - Airport Express. Direct route to the Albuquerque International Sunport. Other ABQ RIDE Routes - There are nearly 40 other ABQ RIDE bus routes that get you just about anywhere in the city. ABQ RIDE Route 157 - To Cottonwood Mall, Coronado Center, ABQ Uptown and Kirkland Air Force Base. ABQ RIDE Route 251 - Weekdays to the Journal Center business district, Century 24 Theatre, Cottonwood Mall, Intel and Rio Rancho. Rio Metro Route 208 - Weekday service from Belen to Downtown Albuquerque, with stops in Los Lunas, Peralta, Bosque Farms and the Pueblo of Isleta, during the morning / midday when the Rail Runner does not operate. Santa Fe Trails Route 6 (Rodeo Road) To Christus St. Vincent Regional Medical Center, Rodeo Business Park East, and the Santa Fe Place Mall. Bus stops are located on Zia Road on the east side of St. Francis Drive (no direct service to Zia Rd Station). NM Park & Ride Orange Route Weekdays between Las Vegas and Santa Fe. NCRTD Route 160 - Weekdays between Santa Fe, Española and Santa Clara Pueblo. NCRTD Route 200 - Weekdays between Santa Fe and Española. NCRTD Route 220 - Weekdays between Santa Fe, Tesuque, Pojoaque and Española. NCRTD Route 280 - Weekdays between Santa Fe, Eldorado, Galisteo, Stanley, Moriarity and Edgewood. NCRTD Route 290 - Weekdays between Santa Fe, Eldorado, Galisteo, Stanley, Moriarty and Edgewood. NCRTD Santa Fe to Taos - Weekdays between Santa Fe and Taos. NCRTD Mountain Trail Route – Daily service to the Santa Fe National Forest and Ski Santa Fe with stops throughout downtown and at 10,000 Waves. general public to participate in. Additional competitions will occur at a variety of venues throughout Albuquerque and surrounding pueblos, and even a location in Santa Fe. “We’re using iconic venues,” says Riker. 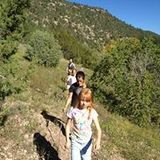 “We will be using Las Campanas in Santa Fe for cycling, Cochiti Lake for the triathlon, and Balloon Fiesta Park for archery, 5K power walk and 5K race walk. We’re also using The Pit for our Celebration of Athletes.” All of the competitions and events are free for spectators to watch. VOLUNTEERS NEEDED This prestigious event provides the communities and citizens of New Mexico a unique opportunity to showcase the amazing cities, venues, and culture in the Land of Enchantment. One way to do so is to help with the games. Approximately 3,500 volunteers are needed to help out with activities like greeting, check-in, hospitality, data entry, and event set-up. Volunteers can easily register for 4-hour timeslots online at www.nsga.com/volunteer, or contact volunteer@nsga.com for additional information. Award winning local service with a national reach. 2015 2016 The Local’s Choice. Not Just for State Employees. Experience the credit union difference with rewarding accounts, low loan rates, and the second largest nationwide network of ATMs & branches. 800.983.7328 | SECUNM.ORG Federally Insured by NCUA. It’s All About Family and Food At Church Street Café It is a family restaurant. From the photos on the walls, to the chef in the kitchen, Church Street Café is a testimonial to what family means to owner Marie Coleman. Coleman was a young mother studying radiology in Albuquerque when she bought a house in Old Town. “We had to push spider webs away when we walked through the building,” she says. “But it was fascinating! It was 300 years old.” Initially, Coleman’s aunt, Reina Jaramillo, was angry about the purchase. “She told me ‘Marie, you are in school. You have no business putting any money down on a house’.” The building, however, soon captured Reina’s imagination. “It was my aunt’s idea to turn it into a restaurant,” Coleman says. “She said, ‘This is a restaurant and you are going to put the kitchen right here’.” That kitchen has been expanded a couple times as the café grew from 80 seats to about 250. THE CUBA CONNECTION There is a photo of aunt Reina and Coleman’s mom, Rita, hanging in one of the front dining rooms at Church Street. They are little girls, maybe 4 or 5 years old, and it was taken in Cuba, N.M., where Reina eventually owned and operated the Silver Star Saloon. Marie Coleman grew up in Cuba and worked for her aunt at the Silver Star, “But I never dreamed I would go into the restaurant business.” Why should she? Her uncle took her out to lunch one day and gave her an early lesson in restaurant ownership. “My uncle and I had gone someplace to eat and while we were sitting at our table, he asked me if I saw the man mopping the floor,” says Coleman. “I said I did, and he said ‘he’s the owner’.” Despite that early introduction, Coleman has been running Church Street for 25 years. That’s what happens when you are born into a family of restaurant owners. Her mother’s brother owns El Bruno’s Restaurant Y Cantina, with locations in both Cuba and Albuquerque. And Marie’s brother, Jim, is the man in the Church Street kitchen. “My brother is the best cook in the family,” she says. “He is always coming up with something different, saying ‘here, try this,’ or ‘take a bite of that.’ I am a good taster.” Coleman typically eats huevos rancheros or breakfast burritos first thing in the morning, and she is partial to Jim’s carne adobada, pork marinated and baked in red chile. It is smooth and warm, perfect for a cold morning. Her best sellers, A plate of carne adobada, beans and however, are enchiladas, a tortilla is a great way to get the and Coleman prefers homestyle taste of New Mexico. Photo Christmas rather than red by Martin Frentzel. or green alone. Church Street Café in Old Town is a labor of love for owner Marie Coleman and her brother, Jim, who is “the best cook in the family.” Photo by Martin Frentzel. The menu includes great salads and sandwiches, and Jim Coleman is also coming up with a new appetizer, which includes avocado fried like a chile relleno. You can learn everything you ever wanted to know about Native American rugs, jewelry, pottery and more – traditional to contemporary, real or fake – during the 40th annual American Indian Week being celebrated April 22 to 28 at the Indian Pueblo Cultural Center in Albuquerque. Center spokesperson Joel Wigelsworth says workshops conducted by Native American art experts are scheduled during the week, as are Native dances and the Spring Art Market. “There will be two groups of dancers performing every day,” Wigelsworth says. “You might see an Eagle Dance or a Buffalo Dance or something else, but that will be determined by the groups performing that day.” Each group performs both morning and afternoon. EDUCATION AND SALES Several dozen artists will have booths at the April 2728 art market. “There will be jewelry, pottery, painting, housewares and clothing,” he says. “And I don’t remember a market when we did not have a drum maker in attendance.” Those who can’t visit the center during the week’s celebration can benefit from visiting with the sales staff in the Shumakolowa gift shop. Deanna Martinez, of Mescalero Apache and Navajo heritage, has worked there for more than seven years and does not judge her work day by sales receipts. “I want our customers to leave here knowing what jewelry, pottery and blankets mean to us Native New Mexicans,” Martinez says. “That education can be the greatest gift of all. From jewelry to rugs, these are all gifts from Mother Earth to us.” Shumakolowa is the Zuni word for dragonfly. Other local Native names for dragonflies are Da-Wah-ga (Keresan), P’oetsideh (Tewa), Tdah-She-Khoda (Tiwa) and Ba’ahwha (Towa). The center is dedicated to preserving the traditions and cultures of the 19 pueblos in New Mexico. It contains a museum with thousands of rare artifacts and works of art created by pueblo artists. Deanna Martinez is part saleswoman, part educator at the Indian Pueblo Cultural Center. Photo by Martin Frentzel. MEMORIAL DAY WEEKEND SATURDAY AND SUNDAY, MAY 25 & 26 NATIVE TREASURES ART MARKET Santa Fe Community Convention Center Over 200 invited artists offering jewelry, pottery, sculpture, two-dimensional art, fashion, carvings, basketry, beadwork and textiles. All Native Treasures programs benefit the Museum of Indian Arts and Culture exhibitions and education programs. Saturday Early Bird Shopping: 9–10 am · $40 Includes full Saturday and Sunday entry. 2018 Inlay Basketry Cuff by Jason K. Brown (Penobscot Nation, Maine) .934 Argentium Silver, hand woven brown ash, Kingman turquoise, lapis, dalamation, Maine red and brown jasper, Siberian jet, Ethiopian opal, shed deer antler, Maine rhyolite and Maine orange granite. on the rail, all year! Outdoor Recreation, Dining, Shopping, Museums, & More! UNM ATHLETICS LOBO TICKETS ON SALE NOW! Theo Anderson on the New Mexico Rail Runner Express on his way to visit his Grandparents. Photo Courtesy of the Anderson Family. Jiron children and father, Michael, in front of the 2926 Locomotive. Photo Courtesy of the Jiron Family. S AN TA F E ’ S NE W P L AC E TO ME E T . . .
patches or lozenges as appropriate, mailed directly to the registered participant. ALPHABET SOUP: Darts, Pontoon, Mah Jong, Yahtzee, Quoits, Poker, Whist, Fives, Chess, Marbles. indoor patio table and watch all of the casino excitement. If you’re looking to simply wet your whistle, swing by the 360 Lounge, Poker Pub or Main Street Bar, and ask about the drink specials. Let us entertain you. With 2,800 plush theater-style seats in Legends Theater, every seat is a good seat. Experience performances from some of the best comedians, rock legends, country superstars, and premier tribute bands in the business. Legends Theater features more than 20 headliner performances every year. The fun doesn’t have to end when the sun goes down. Relax in one of the 154 newly renovated rooms at Route 66 Hotel. Refreshed from floor to ceiling, a recent $2 million remodel features an inviting ambiance of lively designs, modern furnishings and many upgrades to make your stay comfortable. Re-energize with in-room amenities from top brands like Simmons Beautyrest®, Starbucks®, and Bath & Body Works®. Hotel reservations are available now. For rates, member discounts and reservations, please call 866-711-STAY (7829). The entire family can get their kicks at Route 66 at Kids Quest and Cyber Quest, the on-site hourly child care and a non-violent game arcade. Route 66 Casino Hotel is the only casino property in New Mexico to offer this children's program. Open seven days a week, Kids Quest accepts children ages 6 weeks to 12 years. The best gaming, dining and entertainment is just a hop, skip and short 18-minute drive west of Albuquerque, exit 140 on Interstate 40. Get all the latest Route 66 Casino Hotel news and announcements at www.rt66casino.com. Get away from the everyday and head toward excitement. Enjoy thrilling casino action, delicious dining options, top-notch entertainment and then stay the night in our classy and comfortable hotel.